There was a reason for their (sheepish) return. Three big holes. She says she might learn to darn when she retires, and not to give up on her in that department. I remember these socks. I am pretty sure I ripped the wool from a recycled jumper, and it was my first effort at making my own self striping yarn. I made two pairs, the other pair in purple and blue and grey shades. The skein went from one end of the hall to the front window of the house between two chairs. These are big holes, and I had no matching yarn. I promised visible mends and decided not to darn. 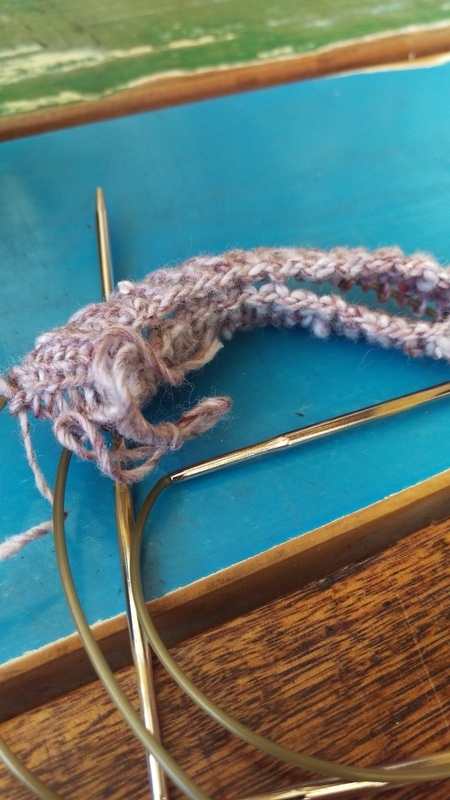 Instead–picking up stitches and knitting a patch, knitting or purling two together at the edges where the yarn was still sound. Then sewing the last round of stitches down with a darning needle. I am on a project to create my own sock yarns this year using natural fibres. As part of the dyeing–because I like wildly coloured socks! 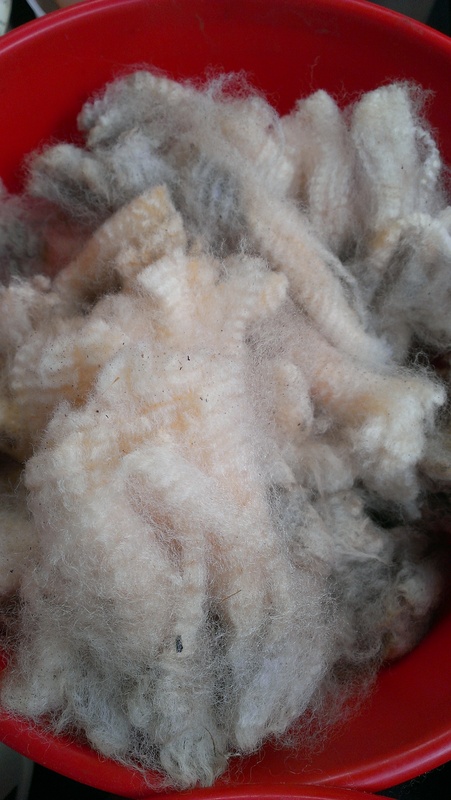 I decide to dye some mohair and suffolk fleece. I have some dyes that were gifted to–or abandoned in–the dye room at the Guild. 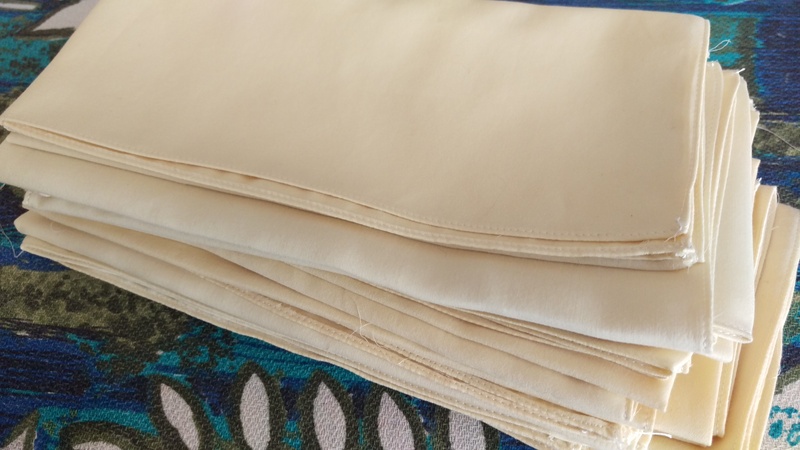 This time I chose Quebracho–which was not mentioned in any of my dye books but I assumed would require an alum mordant. I organised that, and found to my surprise that the preparation of quebracho I had completely dissolved. It’s a tree-based dye so I had rather imagined it was finely ground wood. Wrong. Interesting! Then, a second surprise. I thought it would be red, but actually, quebracho comes in a range of colours and I had quebracho yellow. Which was a shame, really, as my second dye pot was dyer’s chamomile. Never mind. 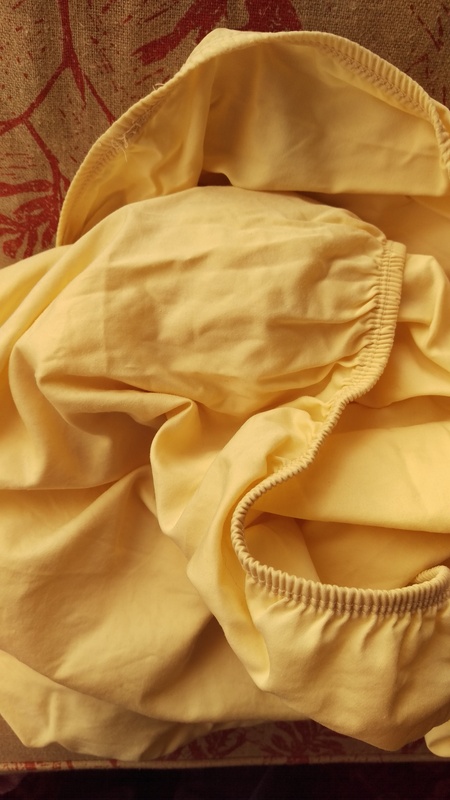 Yellow fibres can be readily blended and overdyed and needless to say I have some fibre dyed with eucalyptus destined to join this blend which might blend beautifully….. The first dye bath from each came out rather splendidly and intensely yellow (quebracho on the right), and I was reminded that dyers’ chamomile always smells edible. Also, that it might be the right time of year to harvest this plant again (I took secateurs to the dead flowers of a patch growing in a city park last year). I love the smell of eucalyptus, but edible isn’t the thought that comes to mind! I ran exhaust baths with some of Viola’s (crossbred) fleece. It had been in a cold alum mordant bucket for some months. Perfect! Ready to go at just the right moment! Another win for slow dyeing processes… and one step closer to an all natural sock yarn. Speaking of spinning my own sock yarn, let me introduce my wool. 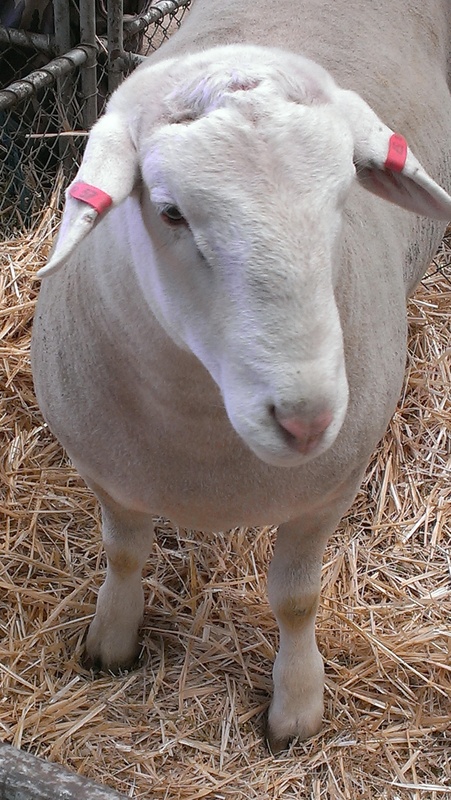 While I was at the Show last year, I checked in with the Suffolks. They were the featured breed for 2015. As it happens, I bought a kilo of suffolk at the Guild when there was an opportunity a while ago. I came home keen to wash fleece somehow. I try not to resist that inclination no matter how daft, because it doesn’t happen often. This time it was pretty daft–I finished after dark and could only hope the fibre would be clean in the morning. 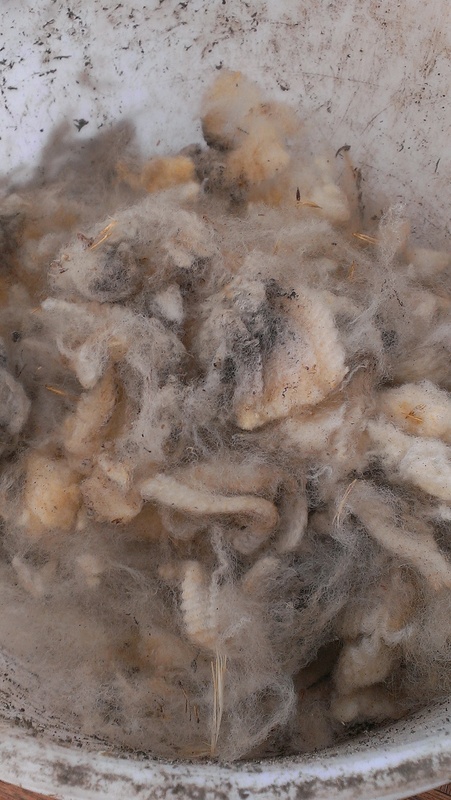 I don’t think the fleece was skirted… so there was some serious loss, not to mention burrs, wattle seed (that is a new one!) and feathers (that was new too). Meanwhile, I had a helper. 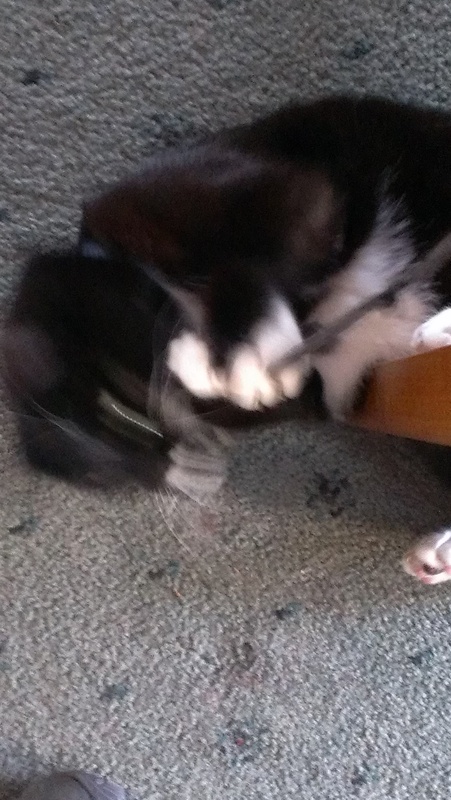 She has since left us for a new life in Tasmania, but she was so interested in knitting! A shame really. I cut out a pattern and she chewed on the paper. Ooops. And here she is sorting out an apron string! You just can’t be too careful with an apron string when it is hanging provocatively off the side of a chair. This post arises from a pair of socks I just recently finished, in time for the birthday of my beloved fairy-goddess-son. They started off with a gifted yarn, Noro Taiyo S69. It’s cotton-wool-polyamide-silk. Something in me just loves a gift from my beloved becoming a gift to our ever growing and beloved friend. Here we are at the start, on the beach. Casting on. If you look carefully you’ll see that the colour effects for which Noro are famous must be achieved by spinning, while in many other commercial yarns they are achieved by dyeing after the yarn has been spun. Here I am making a little progress watching other people swim, unable to remember why I didn’t bring my bathers. Noro is a Japanese yarn company justly famous for the colours it uses and its selection of yarns that feature a sequence of long, changing colours. As a person who loves knitting socks from their yarn (whilst always thinking that the fibre miles involved mean I should never do it again), I think the experience offers some tips for the spinner who may wish to create her or his own sock yarn. On a beach, at a picnic, on holiday. Home grown basil and backyard hen eggs! Lesson 1: Three plies? Why bother? Noro sells at least two sock yarns that are unplied singles, and this is one of them. Everything I have learned about how to create one’s own sock yarn suggests that a minimum of three singles should be tightly plied together to create a tough sock yarn. Lesson 2: Knots? What is the problem with knots? Spinners really try to create one continuous thread. Novice spinners curse when their thread snaps and requires a splice of some kind when plying. Noro seems not to care. You can be knitting away and find a knot right in the middle of a colour sequence. It isn’t joined up to continue the colour sequence you expected, either. The knot might join two colours together abruptly and disrupt any repeat colour sequence completely. 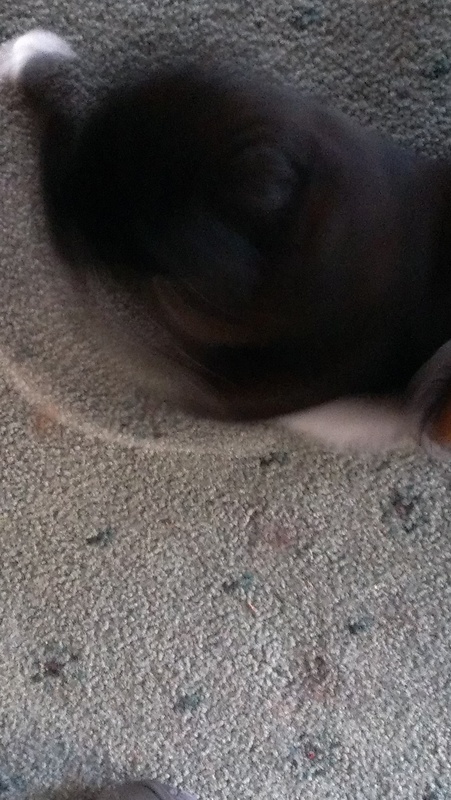 As happened twice in this ball! Lesson 3: Vegetable matter–just accept it. Spinning is a craft that should not be taken up by the squeamish. If you are going to process raw fleece, get your tetanus booster and set out squick meter to low, because any minute you will be dealing with grass seeds, chaff, burrs, seeds, dead beetles, sheep manure, mud and, umm, things you can’t identify… and that might be for the best. Once I removed a dead mouse from a fleece I was processing. Hand spinners try to remove this vegetable (and animal) matter from our yarn. So does Noro. But Noro sometimes fails, and so do hand spinners. Lesson 4: Unpredictable colour changes can be perfect. When I am knitting Noro, there are always times when I just LOVE the colours. And other times when I wonder how much longer I will be knitting this unpleasant grey shade of mauve. Perhaps I should be less judgmental of my own colour choices. Would I apply the same scheme of judgments? Lesson 5: Evenness is overrated. In a Noro yarn, some sections will be at least double or three times the thickness of others, and slubs are a constant. I still love knitting Noro, and perhaps I could take the same attitude to any yarns I make that are uneven or slubby? Alert readers will have begun to suspect that I have a plan to spin sock yarn this year. This is the only way I’ll have locally sourced fibres or naturally dyed socks, or even both at once. More soon! This morning, I went out with some saltbush I’ve grown from seed and some other plants a friend has grown and given me for guerilla gardening. She comes from a coastal area and is growing plants well adapted (and mostly endemic) to her local sandy soils. They are thriving in sandy areas of our suburb. So the saltbush went in under a large river red gum in our neighbourhood, the better to protect the root zone of this giant tree. Then I trundled around to a spot in the neighbourhood where the pattern of what will grow is very different to the rest of the patches I’m working, partly because the new beds created here in the wake of major infrastructure works are very sandy. In went several of these native hibiscus, an olearia, a kangaroo apple and a rhagodia (seaberry saltbush). Out came weeds, alive and dead, and feral tree seedlings. The tiny E Scoparias that my friends and I planted months ago are thriving here but still small. The council has planted a random eucalypt and a Manchurian Pear since we put them in, and they were much bigger–but they left the E Scoparias to live, bless them. Let’s see how it goes. Where previously nothing grew, now there are a lot of boobiallas (myoporum), some good sized olearias, a few saltbush and a couple of feijoas as well as the trees. One saltbush is loving it here and has set fruit. As I finished watering the new plants in and set off to weed invasive grass out of a very successful patch nearby, one of the cyclists whizzing past called out ‘good work!’ It was a good way to start the day: kneeling in the earth and planting things that might help it heal. I think it is Grackle and Sun who put this expression into my vocabulary. I have been looking at the chemical dyes I still have in my possession and wondering about them. I think it’s best I don’t make any commitments for all future time… but it seems right that I try not to acquire any more. It also seems right that I use up those I already own, given that nothing I do with them will mean that they were never made. Finally, I had a thought. 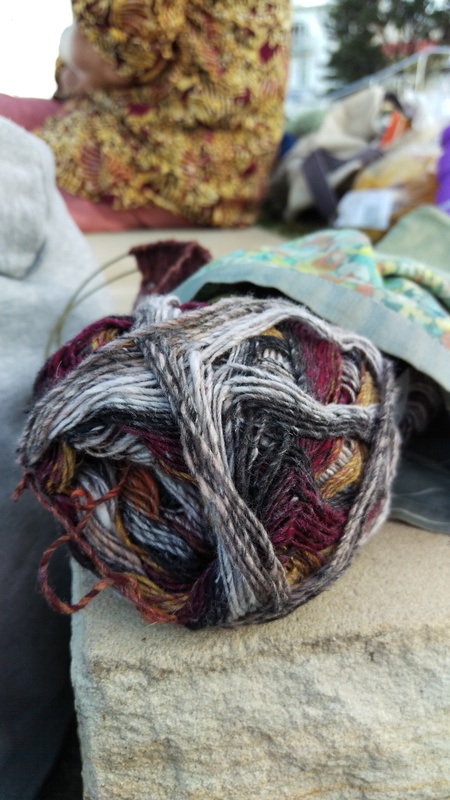 The thing I love most about the Earth Palette cold pad batch dyes (locally made and allegedly low toxic)–is that you can dye greasy wool with them, rather than washing first and dyeing later. A friend from my guild called to ask for advice about these dyes (she is an acid dyer usually) and I suddenly saw it: I could dye these amazing greasy English Leicester cross locks from a local grower. Without prior washing. I still have a lot of this dye mixed up and ready to use (in fact, this is almost my entire stash: just one bag of sky blue dye left unmixed). The weather was perfect: hot days expected. It doesn’t look good when applied to greasy, dirty wool. Two days in the hot sun and the bag smelled of ammonia from that raw fleece being in the heat. The mud that ran out of it when I rinsed was unbelievable. And then out came clean dyed fleece. Yes, these are before and after pictures of the same locks! I made three different ‘dyelots’ in all. The lustre of this longwool is amazing! Now all I have to do is figure out what to make with it. I believe I acquired it thinking about dyed English Leicester locks I had incorporated into art yarn batts. I don’t currently feel motivated to do that kind of spinning–but could make batts and gift them to the Guild. Or spin EL yarn. Or let them sit quietly until the perfect idea comes to mind. What do you think? Once upon a time, (well, it was just before the year 2000 began at a folk festival, actually), I bought this pair of Thai fishing pants. I had never seen a garment like them before, and I had never owned anything hand woven before I made the big decision to buy them. They have had some mending and a lot of wear, and finally, it has come to this. They once had a green pattern, but it has long since washed and worn away. They have been in the cupboard where garments for re-use go awaiting a good idea for a few months. This week I decided that this fabric was too worn to be the outer of a bag, but it would probably make a suitable inner lining. I cut them apart, ripping the beautifully finished seams away from the main fabric and cutting off the hems and tie. The bigger pieces readily made a lining for this bag, cut from fabric left over when I made a dear friend a cabbage print shirt. In the end, I sewed together the leftovers and ended up with enough to line two more bags. I can’t remember where I got this lovely batik fabric, but I think it was a garage sale. It was square, with a border around the edge. Perhaps a small table cloth? Perhaps a wrap? Now it is three bags! As I looked at all that now remains of those much loved pants, I had a thought. The seams and hems and tie would do a perfectly good job of tying up a dye bundle. And needless to say, I couldn’t stop at four bags! Part of our holiday was spent staying with a long standing and treasured friend in a beachside suburb of Sydney. It was a wonderful time but also an unseasonably cold, wet and windy one, so there was more walking than swimming and more knitting time than I anticipated. The plants along that coast are just perfect for basketry. Or in my case, string making. Here, dianellas growing right by the sea. I also made string with cordylines from here and there, picked up on walks, beginning when we were on the Mornington peninsula staying in a place with immensely long leaved cordyline. I tried twining pieces of shell and coral picked up on the beach into the string (successfully! I will do that again)… I taught someone else to make string. I gave string away. I left string in people’s homes to be found later. I made string while sitting, chatting and walking. I came home festooned with string. Then one night after we arrived home I was playing guitar and the string was very much in the way. So I gave away all the looser string on my wrist and now I have just this left as a holiday memento.